Unless you’ve been living under a rock, you know that adult coloring books are now a “thing.” While most are content to color Mandalas and other geometric patterns for their post-workday stress release, there are others whose existential angst requires more lively content. 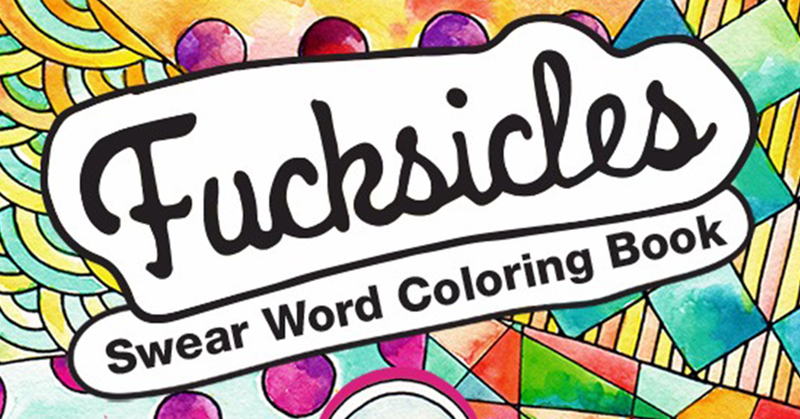 This is why the Swear Word Adult Coloring Book was created. Enter Fucksicles. John Tommervik’s book combines shiny, happy images featuring popsicles with the expletives many of us use to get through our days. Spending a couple of hours carefully applying color to a page filled with frozen treats shaped to spell out “B-A-S-T-A-R-D” may be just what one needs to unwind. It’s definitely cheaper than therapy at $200 per 50-minute hour. John graduated from Miami Ad School’s Graphic Design program back in the fall 2003. He’s a part of a trio of siblings—two brothers and a sister—that attended Miami Ad School in South Beach between 2001 and 2003. Miami Ad School: What possessed you to get into the “sweary” adult coloring book genre? John: I like industries that are a little taboo to the mainstream. These industries are wide open in terms of branding and the lack of rules allows for seemingly infinite possibilities. MAS: Were you a real potty mouth as a child? John: I didn’t swear much at all when I was younger. One of my best friends in college made swearing sound like an art form, so he was my mentor. I see swearing as an expression. I don’t subscribe to the notion that it’s all bad. There’s a time and place for it all. Probably not the library. MAS: Aside from your coloring book designs, what types of projects do you do for your clients these days, and how has that changed over the course of your career thus far? John: I stopped freelancing several years ago to focus solely on my own product development, branding and marketing. Creating and publishing my own coloring books is currently taking up most of my time. Before that I self-published iOS apps and have launched several websites and blogs. MAS: What was the most important thing you learned at Miami Ad School? John: Wow. What a question. Miami Ad School inspired me and taught me a lot of things, especially my teachers. But, the most important thing was: get away from the computer and get your hands dirty… make things with your hands. The more digital we go, the more important analog becomes. The friendships I made, with students and instructors, have been invaluable in my evolution as a creative. Whether they know it or not, their accomplishments and successes continue to inspire and fuel me to be a better creative. Most notably: Paul Lebel, Ali Ali, Viktor Wahl, Jinho Kim and Dave Mizrachi. In addition, instructors Carlos Perez and Jose Guillermo Diaz were very influential with their teachings. When you cultivate creativity, your possibilities are endless. Next quarter begins July 5th. Apply Now!